For over 40 years, the Hampshire Cycle Club (HCC) has been dedicated to the participation and promotion of bicycle racing. Our club is a member in good standing of the USA Cycling Association (USAC) and the Wisconsin Cycling Association (WCA). All club members are encouraged to compete in events sanctioned by both organizations and to be involved in the promotion of our club’s races and charity events. 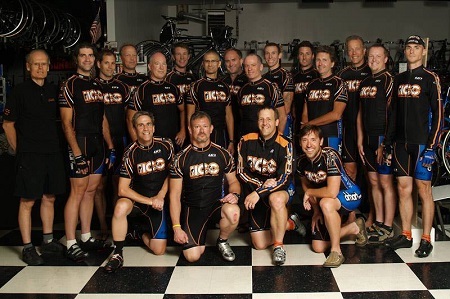 During those past 40 years, it is estimated that over 500 riders from Milwaukee and the surrounding area have been members of the Hampshire Cycle Club! Hampshire Cycle Club promotes several bicycle races each year. These races provide opportunities for hundreds of area cyclists to compete and gain valuable competitive cycling experience. We promote two annual races: the Muskego Park Circuit race and the Estabrook Park Cyclo-cross race which are held in May and November respectively. Throughout the years, we have also promoted the Wisconsin State Cyclo-cross Championships, Kringle Kross and free cyclocross clinics. Our club members have years of experience in all types of racing: road, cyclo-cross, mountain, track, fat tire and gravel. This experience and knowledge is shared with new or younger riders on organized training rides and in HCC sponsored clinics. Our training rides provide the foundation for bicycle racing and also gives you the opportunity to hone your cycling skills. Interested in joining our team? Contact us if you have any questions regarding membership or complete our on-line application and return it to membership@hampshirecc.org. We look forward to hearing from you.